Television news -- and much more! For covers and seven- to nine-page previews of Marvel Comics titles arriving in stores on Jan. 21, CLICK HERE. Titles include Astonishing X-Men #28, Dark Avengers #1, Dr. Doom and the Masters of Evil #1, Ender's Shadow: Battle School #2, Ghost Rider #31, Guardians of the Galaxy #9, Marvel Adventures: The Avengers #32, Mighty Avengers #21, Moon Knight #26, New Exiles #17, Punisher: Frank Castle #66, Spider-Man Noir #2, Squadron Supreme #7, Thunderbolts #128, Uncanny X-Men Annual #2, War Machine #2, Weapon X: First Class #3, Wolverine: Origins #32, X-Factor #39, X-Men: Kingbreaker #2, X-Men: Legacy #220 and Young X-Men #10. For previews of IDW Publishing titles arriving in stores on Jan. 21, CLICK HERE. For previews of Image Comics titles arriving in stores on Jan. 21, CLICK HERE. For previews of Archie Comics titles arriving in stores on Jan. 21, CLICK HERE. For previews of Devil's Due Publishing titles arriving in stores on Jan. 21, CLICK HERE. Warner Bros. and 20th Century Fox has reached a settlement over the film rights to Watchmen, allowing the movie to be released on March 6 as scheduled. According to Variety, Fox's logo will not appear on the film, but the studio will get a gross participation in Watchmen that scales between 5 percent and 8.5 percent, depending on the film�s worldwide revenues. "Warner Bros. and Twentieth Century Fox have resolved their dispute regarding the rights to the upcoming motion picture Watchmen in a confidential settlement. Warner Bros. acknowledges that Fox acted in good faith in bringing its claims, which were asserted prior to the start of principal photography. "Fox acknowledges that Warner Brothers acted in good faith in defending against those claims. Warner Bros. and Fox, like all Watchmen fans, look forward with great anticipation to this film's March 6 release in theatres." BATMAN: THE BRAVE AND THE BOLD: "JOURNEY TO THE CENTER OF THE BAT!" The Friday, Jan. 30 episode of Batman: The Brave and the Bold on Cartoon Network will be "Journey to the Center of the Bat!" In the episode, Atom and Aquaman shrink themselves to fight a virus in Batman's bloodsream after he's been poisoned by Chemo. Atom is voiced by James Sie. The episode is written by Matt Wayne and directed by Michael Chang. Look for more Batman: The Brave and the Bold news soon here in The Continuum. The CW has released new gallery images for the Season 8 cast of Smallville, including a group shot. The images show Tom Welling (Clark Kent), Allison Mack (Chloe Sullivan), Erica Durance (Lois Lane), Justin Hartley (Oliver Queen), Aaron Ashmore (Jimmy Olson), Sam Witwer (Davis Bloome) and Cassidy Freeman (Tess Mercer). Click on the thumbnails for larger and fuller images. Look for more on Smallville soon here in The Continuum. Graham McTavish is providing the voice of Loki in the Hulk vs. Thor portion of the Hulk vs. movie, arriving on Jan. 23 from Lionsgate. Loki, aided by Amora, separates Bruce Banner from the Hulk and takes over the creature on an assault on Asgard and Thor. "With somebodly like Loki, there's an element of arrogance and pomposity that informs the tone that he has vocally," McTavish said. "He loves the sound of his own voice, and he thinks he's tremendously clever. So he savors things and I wanted to bring that to the vocal performance." The voice cast of Hulk vs. Thor also includes Fred Tatasciore as Hulk, Matt Wolf as Thor, Grey Delisle as Sif, Kari Wahlgren as Amora, Bryce Johnson as Bruce Banner, Janyse Jaud as Hela, Jay Brazeau as Volstagg, Jonathan Holmes as Fandral, Paul Dobson as Hogun, Michael Adamthwaite as Balder and French Ticker as Odin. Jamie Simone is the voice director. 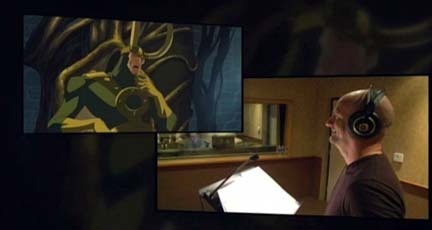 For a video feature on the voices of Hulk vs. Thor, CLICK HERE. * Sunday, January 11: Eva Longoria Parker talks Avengers movie and Batman: The Brave and the Bold. * Saturday, January 10: Smallville, The Simpsons and Top Cow Productions First Looks. * Friday, January 9: IDW Publishing First Looks, Marvel Comics First Looks, Boom! Studios First Looks, The Dark Knight wins at Critics' Choice Awards and Marvel Comics roundup. 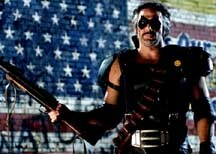 * Thursday, January 8: The Dark Knight dominates People's Choice Awards, Watchmen movie and Spider-Man/Barack Obama. * Wednesday, January 7: Dark Horse Comics for April, Mickey Rourke and Sam Rockwell in Iron Man 2 talks, Wonder Woman's Virginia Madsen, Batman: The Brave and the Bold, Disney XD launch, Watchmen, Archie Comics First Looks and Shrugged. * Tuesday, January 6: DC Comics First Looks, Final Crisis, Marvel Comics First Looks, Super Hero Squad and Star Wars: The Clone Wars. * Monday, January 5: Wolverine and the X-Men, Radical Publishing for April, Marvel Comics First Looks, Dynamite Entertainment First Looks, Batman: The Brave and the Bold, Farscape, Devil's Due Publishing's schedule and Archie Comics for Free Comic Book Day. * Sunday, January 4: Batman: The Brave and the Bold. * Saturday, January 3: Dark Horse Comics First Looks, Boom! Studios First Looks. * Friday, January 2: Hulk vs.' Fred Tatasciore, Batman: The Brave and the Bold, Bluewater Productions for April, Night Projectionist movie and Knight Rider. * Thursday, January 1: DC Comics roundup and Dark Horse Comics First Looks. * Wednesday, December 31: Star Wars: The Clone Wars and Archie Comics First Looks. * Tuesday, December 30: Wonder Woman's Michael Jelenic, DC Comics First Looks, Dark Horse Comics First Looks and Knight Rider. * Monday, December 29: Marvel Comics First Looks and IDW Publishing First Looks. * Sunday, December 28: Moonstone Books for April and The Spirit. * Saturday, December 27: Studio 407 for April and Batman: The Brave and the Bold. * Friday, December 26: Batman: The Brave and the Bold, The Spirit, Battlestar Galactica, Boom! Studios First Looks and Hulk vs.
* Thursday, December 25: Judges grants Fox's Watchmen claim, Antarctic Press for March, Dabel Brothers Publishing for March and Desperado Publishing for March. * Wednesday, December 24: Dynamite Entertainment for March, The Spirit and Smallville. * Tuesday, December 23: Batman: The Brave and the Bold, DC Comics First Looks, Dark Horse Comics First Looks, Image Comics First Looks and UDON Entertainment for March. * Monday, December 22: Batman: The Brave and the Bold, Paradox movie, Boom! Studios for March, Zenescope Entertainment for March, Knight Rider and Dynamite Entertainment First Looks. * Sunday, December 21: Digital Webbing for March, Oni Press for March, Ape Entertainment for March and Smallville. * Saturday, December 20: Del Rey Manga for March, Red 5 Comics for March and The Spirit. * Friday, December 19: Avatar Press for March, The Spirit, Marvel Comics First Looks, Boom! Studios First Looks, Image Comics First Looks, Red 5 Comics First Looks and The CW 4Kids' new lineup. * Thursday, December 18: Cyberforce/Hunter-Killer, Radical Publishing for March, Bongo Comics for March, The Spirit and Marvel Comics roundup. * Wednesday, December 17: Surrogates movie, Top Cow Productions for March, Image Comics for March, Wonder Woman, DC Universe collections, Archie Comics First Looks and Star Wars: The Clone Wars. * Tuesday, December 16: Marvel Comics for March, DC Comics First Looks and Bluewater Productions First Looks. * Monday, December 15: DC Comics for March, IDW Publishing for March, Archie Comics for March, and Dynamite Entertainment First Looks.